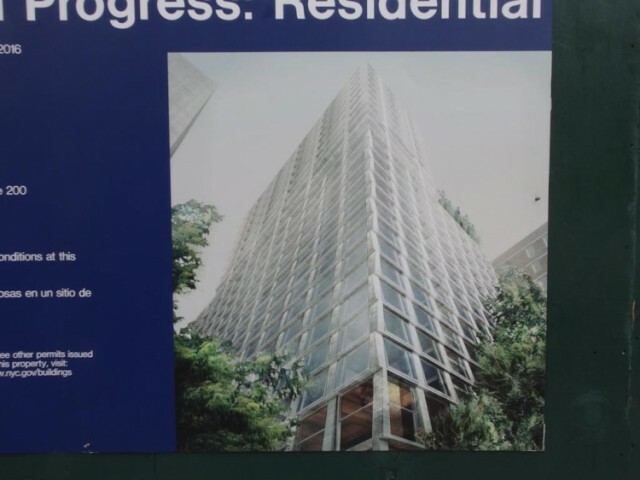 215 Chrystie Street [Bowery Boogie]: Ian Schrager’s mixed-use project at 215 Chrystie Street is finally seeing action. A green plywood fence has been erected in addition to an on-site rendering revealing the glassy, 28-story tower. With a targeted completion date of 2016, the first 18 floors will be a hotel, while the remainder will be residential. 52 Lispenard Street [Curbed]: Developer Murat Bugdaycay is constructing a seven story townhouse at 52 Lispenard Street in the Tribeca East Historic District. The townhouse will have “seven units, ranging from 2,500 to 4,700 square feet,” accompanied by a triplex penthouse. Bugdaycay is also restoring a five-story townhouse at 54 Lispenard. 388 Bridge Street [Brooklyn Daily Eagle]: Construction has finished at 388 Bridge Street in Downtown Brooklyn, resulting in never-before-seen views of the city — and people are taking note, with the building “renting at a rate of one [unit] per day”. 388 Bridge won’t stay in the spotlight for long, as a plethora of nearby skyscrapers are already rising, or will soon sprout. 21-16 44th Drive [The Court Square Blog]: A rendering has been posted on-site at the recently demolished 21-16 44th Drive, in Hunter’s Point. Depicted is a “seven-story mixed-used project,” with an anticipated completion date of mid-2015. Since demolition, no activity has been reported, and construction permits have yet to be filed. 121 Plymouth Street [Brownstoner]: Demolition permits have been submitted for the parking garage at 121 Plymouth Street under the Manhattan Bridge in Dumbo. Developer BBP is going to construct a park facility to accommodate their “new section of waterfront green space”. The facility will eventually contain “restrooms, community meeting space and an environmental education center”.